The Reverend Wendy Luella Perkins was born in Halifax and raised on a small family farm in rural Nova Scotia. As a child, she found deep connection and sustenance from the fields, woods, birds and animals that surrounded her. As a young person, her concern for social and ecological justice was awakened through experiencing and witnessing violence, oppression and environmental degradation. Wendy Luella was the first in her family to finish high school. She went on to graduate from Mount Allison University (BA in Psychology) in Sackville N.B. and the University of Waterloo (MASc in Addictions and Educational Psychology). It was in Waterloo that she was introduced to Unitarian Universalism and felt called to the ministry. 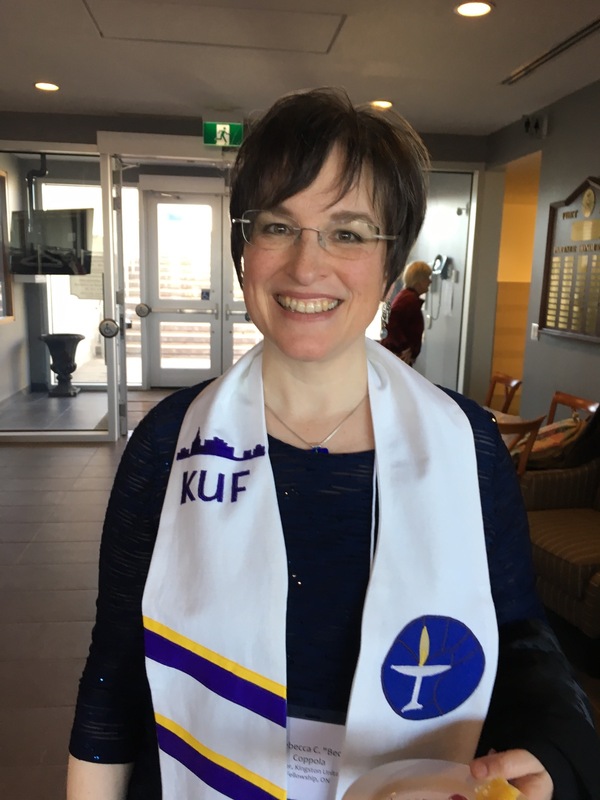 Wendy Luella arrived in Kingston in the fall of 1994 to attend Queen’s Theological College and attended KUF as a student. In 1999 she was ordained as a Unitarian Universalist minister by KUF and the Quinte Unitarian Fellowship. In the spring of 2016, Wendy Luella was designated Affiliated Community Minister by the KUF congregation. These days, her ministry focuses on fostering compassion, connection and creativity, peace, justice and joy through singing, song-writing, community arts, public engagement, community organizing, facilitation and public ritual. Since she was a very young child, singing and making up songs has been Wendy Luella’s main creative outlet. She uses the power of song as a tool to deepen, connect, inspire and transform. She has produced three CDs: Awakening the Compassionate Heart, Lucky Life, and This Very Moment, and has a children’s album in the works. A prolific writer of folk songs and meditative chants, her song “We Give Thanks”, in the teal UU hymnbook (Singing the Journey) and her seasonal song, “Every Night a Holy Night” have been sung in congregations across the continent. Wendy started Soulful Singing, a communal singing meditation practice in 2002. She offers Soulful Singing at various times and places around the community, and here at KUF on the first Monday of the month, 7:00-8:30pm, to which all are welcome. Wendy Luella brings warmth, liveliness, spiritual depth, wonder and gratitude to her ministry and life. She lives in the Skeleton Park neighbourhood in downtown Kingston with her partner, Charlie Walker. Charlie is organist and choir director at St. James Anglican Church. She has two step-children, Jeremy and Monika, and a grandson, Adam. Wendy Luella loves walking to the lake most early mornings, cooking and preserving with fresh, local, organic ingredients, and connecting with the folks in her neighbourhood. Listen to some of Wendy Luella’s songs at CBC Music. To chat with her, or to be put on Wendy Luella’s weekly community connections list, drop her an email at: info@wendyluellaperkins.com. What Am I Rushing To? Since 2013, Wendy Luella has led this community public arts project with a group of others who meditatively sing the song “What Am I Rushing To” amidst the frazzle and frenzy of December. A yarn-fitti installation on the large cannon in Skeleton Park. The cannon was crocheted in white and adorned with 71 blue crocheted flowers to commemorate the 71st anniversary of the dropping of the atomic bombs on Hiroshima and Nagasaki. Co-founded by Wendy Luella in 2015. An annual public gathering at the Peace Tree in City Park to remember all victims of war: military and civilian, ally and adversary, animals and the environment. Community arts project bringing together the Tett Centre for Creativity and Learning, St. Mary’s of the Lake Hospital and community artists. Community arts collaboration with Kingston Community Health Centres and PeaceQuest. For the last number of years, Wendy Luella has been one of the core organizers of this annual commemorative gathering to denounce nuclear weapons. You can often hear Wendy Luella adding her voice for joy, justice and peace around town!